Ali’s half century breathes life for Pakistan - SABC News - Breaking news, special reports, world, business, sport coverage of all South African current events. Africa's news leader. 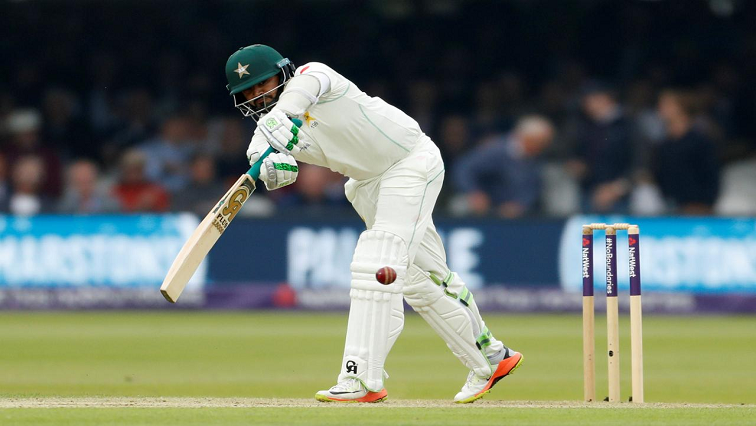 Azhar Ali's resolute half century helped Pakistan reach 139-3 at stumps. Azhar Ali’s resolute half century helped Pakistan reach 139-3 at stumps in reply to New Zealand’s 274 on day two of the third and final test in Abu Dhabi on Tuesday. Azhar who finished the day unbeaten on 62 runs off 169 balls, helped Pakistan recover from the loss of two early wickets to trail New Zealand by 135 runs with seven wickets remaining. Asad Shafiq was unbeaten on 26 after the pair shared an unbroken fourth wicket partnership of 54 at the Sheikh Zayed Stadium. New Zealand pace bowler Trent Boult had removed the out of form Mohammad Hafeez and Imam-ul-Haq with only 17 runs on the board, having both openers caught by Tim Southee in the slips. With Pakistan facing a familiar top order collapse, Azhar stitched together a 68 run stand with Haris Sohail (34) to ease their nerves. A well set Sohail was dismissed when he edged Southee to wicketkeeper BJ Watling, but Azhar and Shafiq dropped anchor to ensure Pakistan did not suffer any more losses. Earlier New Zealand added 45 runs to their overnight score of 229-7 with Watling finishing unbeaten on 77. Off spinner Bilal Asif, who picked up two wickets on Monday, completed his second five wicket haul in tests. New Zealand won the opening test in Abu Dhabi by four runs before Pakistan levelled the three match series with victory in the second test in Dubai by an innings and 16 runs. This entry was posted on 05 Dec 2018,07:52PM at 7:52 PM and is filed under Sport. You can follow any responses to this entry through the RSS 2.0 feed. Both comments and pings are currently closed.